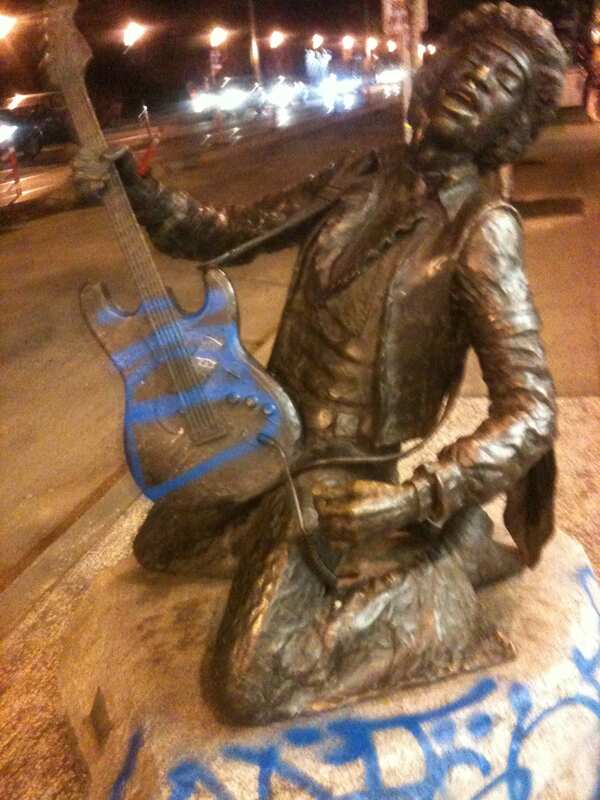 Remember the two young men recently arrested for a drunken graffiti spree that left Broadway’s Jimi Hendrix statue defaced in blue spray paint? What if instead of sending the alleged taggers through an expensive criminal justice process, they were given the option to sit down with those directly and indirectly affected to discuss what they did and come up with a mutual resolution? That’s just one example of where a process called restorative justice could come into play, according to the director of Mayor Mike McGinn’s latest public safety initiative. The Restorative Justice Initiative pilot program is currently being rolled out in the East Precinct in an effort to keep low level offenders out of the criminal justice system and to foster better community relationships. Andrea Brenneke, director of the Restorative Justice Initiative, will be presenting the new program Thursday at the East Precinct Council Advisory Council meeting at 6:30PM in Seattle University’s Chardin Hall, Room 142, at 1020 E Jefferson. EastPAC president Stephanie Tschida tells CHS the organization agreed last month to be the test community group for the new initiative. Brenneke said that it will likely target low level offenders, but could be expanded to more serious crimes or to conflict resolution more broadly throughout different communities. According to Brenneke similar programs have been successfully implemented in several cities in B.C. The program will be designed throughout 2013 and is slated to be implemented in the East Precint in 2014. Participation in the program will be voluntary at first, but Brenneke said she plans to work with the city attorney’s office to make “restorative justice circles” become a formal alternative to pressing charges. Brenneke recently presented the city’s initiative at a meeting in the Garfield Community Center. In a recent community post to CHS, EastPAC posted the following from Central District resident Jim Erickson his reasons for supporting the model after he attended the meeting. In a recent conversation with my son we recalled stupid things that we each did as young adults. There is something about an immature mind inhabiting an adult body. I said that my worst fear was that he would be arrested and be locked up as a lone innocent among hardened criminals. For the first time, now that his son entered college in August, he understands my fears. Wait, this is instead of making them legally responsible for the damage they caused? If they learn their actions no longer come with real consequences, how exactly is this going to deter them? I am in favor of having them meet with those in the community to discuss the impact their actions have had, but they should also still be made to pay for the crime. Jesus, I can’t even get my neighbors to care about how their playing loud music at night affects me. How are you going to get a criminally-minded person to give a crap? The problem with that is how do you enforce the fine when people can’t bother to pay it as is. It isn’t exactly like it’s the upper class from Bellevue driving down here to spray paint Jimmy. They should do what bill collectors do – continue to call these kids and harrass them about paying the bill, tack on late fees, and if the bill still isn’t paid, have it negatively affect their credit. Even the library has done this in the past. hire a collection agency (pay them a % of the fine) to identify their bank accounts and/or income sources and garnish them. don’t give people the option of skipping out on paying their fines. just take the money. i guarantee they won’t commit a crime again. either that or they’ll stop having bank accounts and/or income sources. Why not sit down, and those directly and indirectly affected get drunk, then graffiti the two young men? Roger, may I vote for you for Mayor of Seattle? This is not helpful. If they have no real consequences they will ignore the laws. It’s the same with the smoking pot outside. It’s against the law, the cops can issue tickets but won’t, and say they will issue warnings (without checking if someone has been warned before). Everyone breaks the law because they know all they’ve got to do is but the weed away if a cop asks until that cop is out of sight. Breaking the law should have penalties. I know some will complain about people then “getting into the system” but if they’ve chosen to flout the rules, whose fault is that? We need to go back to people taking responsibility for their actions. These clowns don’t belong in the criminal justice system. How about a corporal justice system? Let’s cane them. One last nail in the coffin for McGinn. Of course these kids are gonna take the sit down, slap on the wrist and talk about feelings action. I wish I would of had that option as a young adult, it would of opened the door for way more fun crime!! Who said they weren’t going to be punished, the people who were victimized get to agree to a restitution, it isn’t like they just get a lecture. It will likely involve community service in some how rather than jail time, which is by far more beneficial to all parties involved. Stop with the “kids these days have it easy” “slaps on the wrist” and “McGinn loves criminals and lets them out” rhetoric. This sounds like an intriguing idea. Particularly for low-level offenders. It would be useless, for instance, for them to end up in jail to learn how to actually commit crime. And if they can be brought to a greater level of understanding (even if they don’t pay for the clean-up or something), and possibly be less likely to offend it’s win-win: less spent on the legal system, which undoubtedly pays for the amount spent on clean-up. a greater level of understanding? if you are an adult, how do you not understand that spray painting a piece of public art is wrong? if they don’t already know that it’s wrong by the time they turn 18, then a group of community members handing them a rag and some paint remover isn’t going to teach them anything different. it’s cool man, you painted jimi and mugged an old blind woman. Let’s rap and figure out a mellow solution that won’t kill your buzz. Not a good idea . They need to be dealt with in the justice system. But for real . Deal with them as they should be. Have you seen inside the bathrooms at the calAnderson park. This damage and jail them. Playing nice will not cut it.Make them pay for it. People destroying public and private property. This is just silly! It’s this coddling attitude towards criminals that’s a big part of the problem. Wow, I am just, wow! I know we all like to witness a good old public execution, but is anyone interesting in actually finding out if restorative justice is effective before damning it? I mean, it may not satisfy your bloodlust and sense of moral superiority, but if it actually works it might be better for the community. Isn’t that really the most important thing? Uhh, and anyone who thinks we “coddle” criminals has never met anyone who has been to jail/prison. Also, our current system? Not working so hot.